Tuesday Night Project (TNP) celebrates its 12th year of bringing together thousands of people to live performance, music, poetry, short film, live-stream broadcasts and an eclectic gathering of Los Angeles art+community through its “1st & 3rd Tuesday Night Cafe” series in Little Tokyo/Downtown L.A.
On July 31st, 2010, TNP presents “TNParty: annual benefit for the Tuesday Night Project” in the JACCC Plaza from 5PM to 11PM. It will be TNP’s 2nd annual fundraiser underneath the Los Angeles summer skyline, with an outdoor plaza full of DJ’s spinning, live music, a silent art auction, video projection, and live painting. Everyone is welcome, from long-time supporters of Tuesday Night Cafe to past performers to people who are new to TNP. 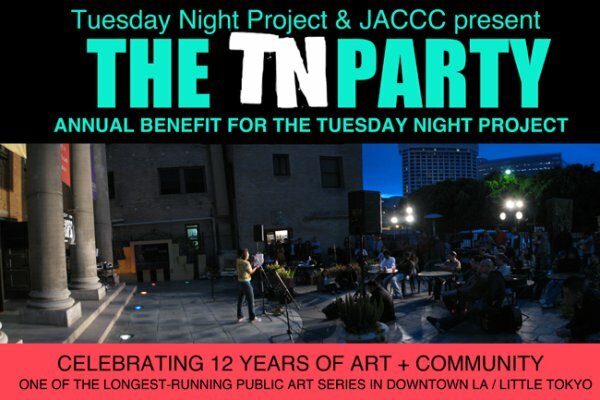 Join Tuesday Night Project at the TNParty and support one of the longest running free public art spaces in Downtown L.A.! Food on sale from The Park’s Finest and Good Girl Dinette! Beer, wine, soda, and water will be sold by JACCC! You’re welcome to bring chairs, mats, blankets, etc.! No coolers, please.